As part of a challenge by Ilva at Lucullian Delights, Kristen over at Dine and Dish posted a picture of her huge kitchen. Naturally, I decided to do the same. 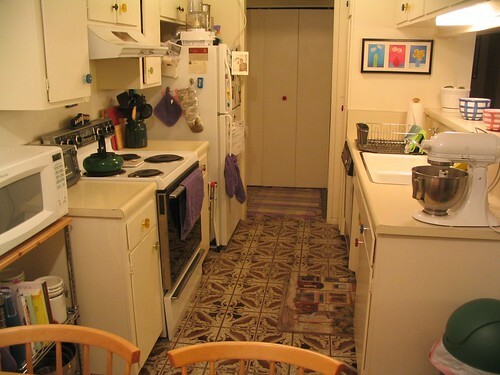 However, being as I live in Hollywood, in a rent controlled one-bedroom apartment built in the 70s, my kitchen is not pretty, or clutter-free, or huge like Kristin’s. And while it’s going through a bit of an identity crisis, the brown tile floor, Formica counter tops, brightly colored knobs, and my KitchenAid mixer are somehow living together in harmony. So yes, this is where, lately, the magic has been happening. January 8, 2007 | Filed Under Misc. That really reminds me of one of my former kitchens. Isn’t this what is called a ‘galley kitchen’? I miss living in apartments. I liked having restraints to deal with – not being able to make major changes and having to work with what was there. Somehow that made it more fun for me. I love galley kitchens and I think your kitchen is just lovely. We looked at a house right before we bought this one that had a nice galley kitchen, and we almost went with that house instead. It’s very functional and obviously works well for you… look at all of the wonderful creations that come out of your beautiful kitchen! Hillary, your kitchen is beautiful, you shouldn’t say otherwise! This is the last i.e 49th Kitchen I saw today. I will never crib abot a small kitchen in a metro now on ….its the same alll over the world….singapore, mumbai……..NY…hollywood. Yet its the place we love and spend a lot of our time. I had that exact same floor in an apartment I lived in during college! Ack!! LOL A galley kitchen is very efficient. It looks like it is set up well. I agree with Anjali – it’s nice to see kitchens all over the world are pretty much the same. Congratulations on your mention on Epi-Log! I used to live in a little duplex with a kitchen even smaller than yours and it had my furnace in it! And you know what? Every time we had guests, people would congregate in that tiny(and ugly) room. The cook puts the heart in the kitchen, not the expensive amenities! I may be small but it is a place to cook. At least you have a place to work your magic!